National and sometimes international political movements often find homes on college campuses, but lately, students are aiming their protest signs at their own universities. Students at Davidson College, a private, liberal arts college in North Carolina, began circulating a digital petition late last month calling for more access to their board. Their main demand is for at least 20 percent of Davidson’s 45-person board to attend twice-annual town halls open to students. A similar movement at Salem College, a women’s college in North Carolina, is calling for board members to participate in mandatory diversity training. Neither of these events exists in isolation, either. 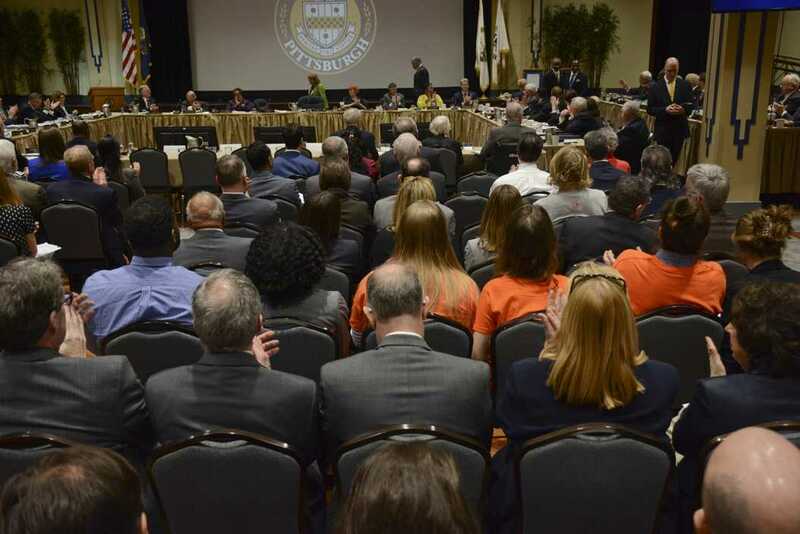 In a growing trend across the country, students are demanding greater access to members of their university’s board of trustees, as opposed to going through channels such as deans and professors to relay messages. Although we’ve seen a plethora of student activism and involvement in many important issues this semester, we’re missing a similar shift at Pitt. While there are certainly issues with Pitt’s board — namely, a lack of diversity of thought, as we’ve noted in past editorials — we can’t criticize it too harshly for failing to take student concerns into consideration because the student groups actively working to lobby the board are few and far between. And we’re doubtful the reasons behind this are due to a lack of frustrated or disgruntled Pitt students who feel like the administration doesn’t listen to them. With students facing issues from education funding to diversity and inclusion to rising student debt, it’s probably quite the opposite. While the chancellor is the one tasked with dealing with the administrative, academic and management authorities of the University, the board holds the ultimate power over all University affairs. If students want to lobby an issue of relatively minor consequence, they’re probably better off going through Student Government Board or the dean’s office. More substantial issues, especially ones dealing with the economics or finances of the University — such as concerns about tuition and student loans, adjunct professors or minimum wage for University workers and employees — is where the Board would most likely come in. There are student groups who have made effective changes, or attempts, when it comes to lobbying and working with the board at Pitt. No Sweat: Pitt Coalition Against Sweatshops — a conglomerate of student organizations committed to banning sweatshops worldwide — was the last group to garner substantial success with the board. Pitt began requiring its apparel licensees to sign documents agreeing not to manufacture products in unsafe working environments in 2014, after a year of student push on the matter. Pitt’s Fossil Free Coalition — a similar conglomeration of 44 student groups pushing for Pitt to divest from the fossil fuel industry — is the only recent example of a student group making any progress with the board. The push for faculty and graduate student unions have likewise garnered support and interest at an administrative level, but other than these select groups, few students have taken advantage of channels that could lead directly to institutional change. Even if you’re not interested in initiating change at Pitt, you should still know what’s going on with the group of people running the University — transparency is an issue we should all rally behind. First of all, while the board has a lot of power, it also has a lot of restraints. Rarely do trustees get involved in Pitt’s day to day. Next, the board doesn’t make most of its decisions based on morality — it’s literally a line written into its constitution. The board can, however, vote to go against that code in extreme circumstances. In the 1980s, for example, the board voted to divest from companies that were aiding apartheid in South Africa. So, if you’re going to lobby to the board, do your research. Come with the numbers crunched, ready to show the higher-ups that there’s an economic imperative for whatever change it is that you want. Or, be willing to make a really insightful argument about the ethical implications of the issue you’re trying to bring to light. The board is made up of 36 voting members, including 12 commonwealth, 17 term, six alumni trustees and the Chancellor. Additionally, there are 12 special and numerous emeritus members of the board who have all the same rights of any board member except the right to vote. The Alumni Association nominates those to be elected as alumni trustees, and the commonwealth trustees are nominated by the state governor, the President Pro Tempore of the state Senate and the Speaker of the state House. And the governor, the Secretary of Education of the Commonwealth and the mayor of Pittsburgh all serve as nonvoting members on the board as well. So if you want to start at the most basic level of lobbying, all the individual names of both voting and nonvoting members of the board can be found online. But if you’re unable to contact these members personally, the nomination process for each of them presents a clear path where students can insert their input as well through the Alumni Association or through the mayor or governor’s office. Even though they don’t vote, they still have the power to speak to the Board members at meetings. The board holds at least three meetings, including the annual meeting, each year. These meetings are open for public viewing but not public comments. If you want to speak with board members, you typically have to wait until after the meeting is over. Since most board members are hard for students to reach, perhaps the most effective way to communicate with the board is through Chancellor Gallagher, since he serves “as the representative of the students, staff, faculty, and administration to the board” — although he’s been known to say otherwise. But Gallagher doesn’t meet with students very often, so your cause would need to have garnered a significant amount of support already in order to catch his attention. If it hasn’t, going through someone else in his office — such as Dean of Students Kenyon Bonner or Vice Chancellor Kathy Humphrey — is likely the next best option. Student Government Board, the student group on campus with the most power to lobby the Chancellor and the board for what students wants, began holding monthly town-hall-style meetings, in addition to their weekly meetings, this semester. The town halls were supposed to be an avenue for more Pitt students to voice concerns to SGB, but they’ve garnered starkingly low turnout rates. Next year, this should change. Standing on street corners yelling at passing cars is fine, but if you’re looking to enact change at the university level, go to the people who can make that happen. Pitt students who feel underrepresented should look to Davidson and Salem as prime examples of what students can do to actively push the administration for change. We won’t know if the board is willing to listen unless we start talking. Editor’s note: A previous version of this story stated that Pitt’s Fossil Free Coalition consisted of 35 student groups, but the Coalition has grown to include 44 student groups. The story has been updated to reflect this. The Pitt News regrets this error.